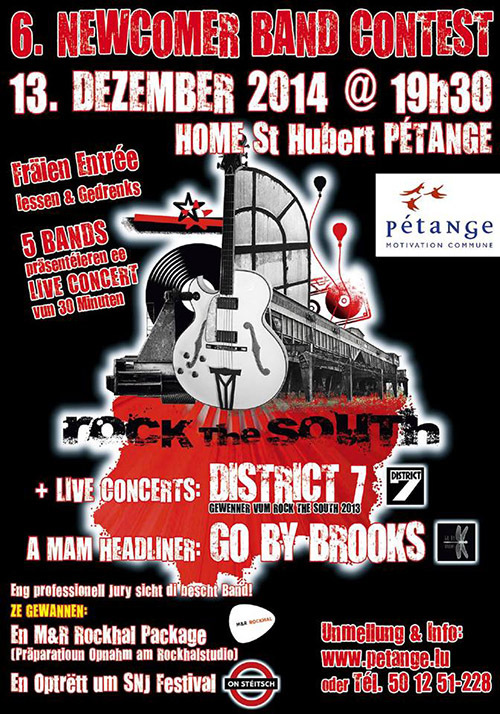 This year’s edition of the Rock the South amateur band competition will take place on Saturday 13 December, beginning at 19:30 at the Home St Hubert in Pétange and will be organised by the local municipality, along with the “National Youth Service” (SNJ) and “Music & Resources Rockhal”. Since its inception in 2009, the contest aims to promote young and local rock bands from the South of Luxembourg, by giving them the stage on which to perform and showcase their talent. Together with District 7 (last year’s winners), we will be there as special guests to perform and encourage the new bands.